The sun is finally shining again and the temperature is slowly rising, it’s Spring in Saugatuck! 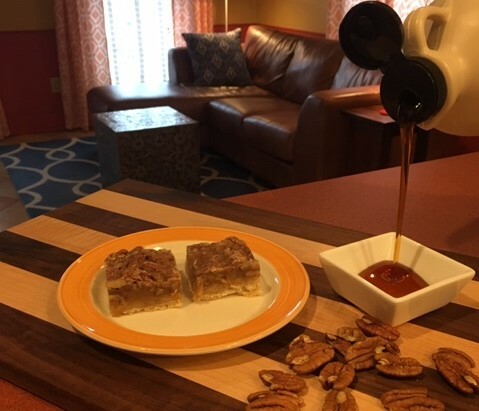 To celebrate, we treat our guests to these delicious Maple Pecan Bars. Michigan ranks 8th in maple syrup production and there are lots of spots to purchase this first crop of the season. Press into foil lined 8X8 pan and bake at 350 for 15 minutes. Crust will be soft and pale. While your crust is baking combine butter, sugar, syrup and milk in a medium saucepan. Bring to a simmer and cook for 1 minute, stirring occasionally. Stir in pecans and pour filling evenly over hot crust. Bake for an additional 18-20 minutes. Mixture will be bubbling and will thicken as it cools. Remove from oven and sprinkle with salt. Cool completely before cutting. I usually refrigerate overnight. This entry was posted in Recipes, Uncategorized by admin. Bookmark the permalink.